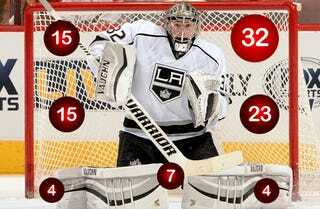 What's The Best Way To Score On Jonathan Quick And Antti Niemi? Goalie performance is extraordinarily important to success in the NHL playoffs (which began last night, FYI). To get you ahead of the curve, Kevin Woodley of NHL.com has broken down the intriguing "goaltender matchup" between LA's Jonathan Quick and San Jose's Antti Niemi, with the help of some goofy, but useful, visuals. Quick's goal chart for the season is above; as you can see, he's given up 32 of his 100 goals this season high glove-side. Niemi is below; he's given up more goals than Quick but has a near-identical save percentage, and is more vulnerable stick-side. Go read a much more detailed discussion of the goalies' relative strengths and weaknesses over at NHL.com. Once you're an expert, you can watch them go head-to-head at 10:30 ET tonight.